From investing in the most sophisticated new refractive surgical technology to widespread press coverage and hobnobbing with the stars, 2015 has been a whirlwind year so far for Advanced Vision Care. In this post, we’ll look over some landmark events that have recently occurred at AVC, which have further strengthened the clinic’s reputation as the leading independent UK vision correction specialist. It was dubbed the Alcon Suite. Launched earlier this summer, this sensational new addition to the AVC clinic is the only place in the UK where three of the most advanced pieces of ophthalmic technology are available for use in one place. Specifically, these are the Verion Image Guided System, the Centurion Vision System and the Luxor LX3 with Q-VUE. Avid readers of our blog will recall that we had discussed these incredible new technologies, and how they have led to an increase in precision and safety, perfecting private Cataract treatment and Lens Replacement. 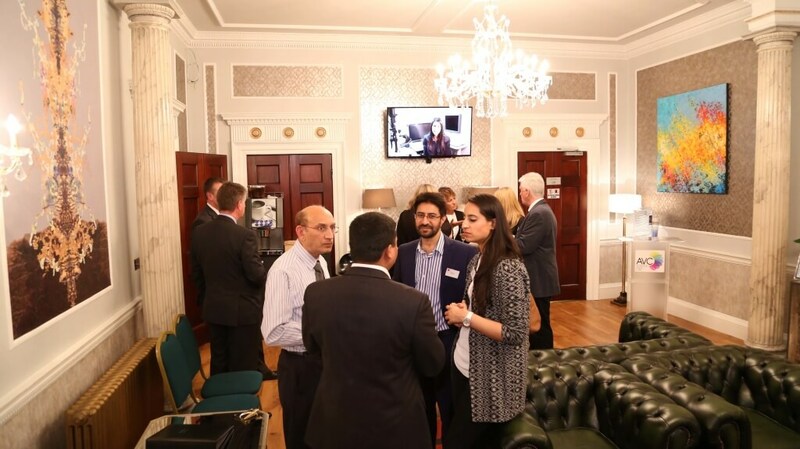 So significant was the development of the AVC Alcon Suite within the field of refractive surgery, that the event was covered by multiple popular media and press publications, including the Daily Express (see: “My Cataracts Were Gone In Minutes – The Technology That’s Giving People Their Sight Back”). As you’ll see below, patients who have had the privilege of treatment at AVC’s new Alcon Suite are routinely flabbergasted at the speed of treatment, the minimal discomfort/healing time and, above all, the vibrancy of their vision soon after surgery. Of course, it does not stop there. Many additional websites have earnestly published news of our Alcon Suite and the positive implications for the Cataract surgery and Lens Replacement industry. The reality is, if you’re not having your Cataract Removal/Lens Replacement at Advanced Vision Care, you’re relying on inferior treatment technology. Two of the biggest thrills that the talented surgeons and staff at AVC enjoy are the widespread recognition and appreciation that we receive from both patients and healthcare professional bodies. 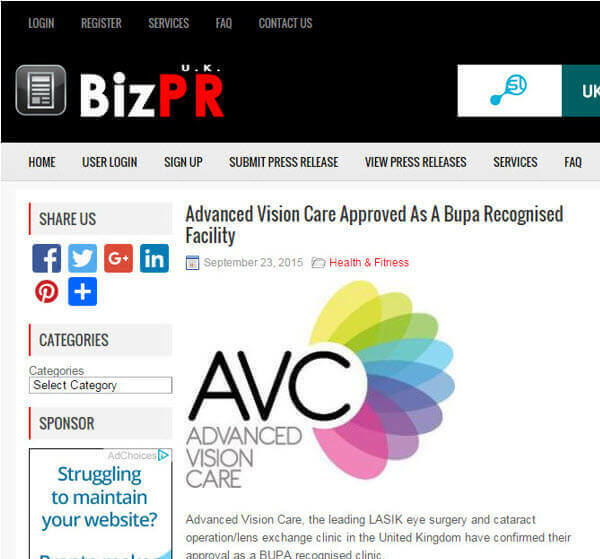 Most recently, Advanced Vision Care was approved as a BUPA recognised vision correction clinic. It means patients who have appropriate BUPA health care coverage can now have their Cataract private treatment via their health insurance plan. AVC also partnered with many other leading health insurance companies including AVIVA, Simply Health, Cigna, Allianz and WPA. In some cases, additional treatments including laser eye surgery are also available through health insurance plans. Endorsement by such global insurance companies is yet further proof that AVC is a supremely trusted UK clinic within the vision correction field. Over 2015, AVC have received more reviews and testimonials than ever from delighted patients. While the full range of patient testimonials may be seen on our website, Advanced Vision Care also have a range of independent patient testimonials on the trusted reviews website, TrustPilot. While we lavish five star treatment on each and every single patient, it’s worth mentioning that several celebrities have enjoyed vision correction at Advanced Vision Care. In fact, celebrity patients Hari Dhillon (Actor on Holby City) and Gina Beck (Wicked) both had vision correction at AVC and even attended the opening of the new Alcon Suite during the summer. We’re truly excited at taking the world of vision correction treatments to the next level. So, if you suffer from any form of vision problem, why not call one of our expert advisors on 0800 652 4878 to talk through potential solutions to your visual needs.